After The Rain by Rita Gerlach is a Christian historical romance. Set in Washington and then moving to the countryside in 1908, it reminded me of Downton Abbey American style, as upstairs and downstairs mingle. Louisa lives with her father and a very over-bearing grandmother who desires to be obeyed by everyone at all times. Her grandmother issues orders but never affection. She is a cold hearted bully. Louisa’s friend is her maid Millie. They have a wonderful relationship that stretches beyond the class divide. Rita Gerlach portrays the differing classes within the novel and reveals a very snobbish attitude of the day. Louisa is rescued from a fall by Jackson, a farmer whom her grandmother looks down on. At first Louisa shares her grandmother’s prejudices but as soon as she gets to know Jackson, Louisa realises “The size of his bank account did not matter. What counted was the size of his heart.” This reminds the reader that God does not look at our outward appearances so much as our inner ones. Within After The Rain is the theme of looking after the widows and orphans. Louisa goes with Millie to volunteer at a shelter for the poor. Here her eyes are opened to the suffering on the streets of Washington. Later Louisa will see a home for children born out of wedlock who are viewed as an embarrassment to their families and needed to be hidden away. Louisa realises that “all children should be loved and not looked at as inconveniences.” Through Louisa, the reader can glimpse the heart of God. There are other prejudices of the time revealed in the novel. Jackson’s sister Blossom has Down’s Syndrome and the family are pressured to institutionalise her, even being threatened with a court order. Jackson is a godly man who knows not only the value of educating Blossom but also the value of loving her extravagantly. Louisa is a very modern woman who knows her own mind. She will not bow down to her elders and knows she needs “no approval except her Creator’s.” She is a godly woman who sees the world with the eyes of love for the poor and marginalised in society. Louisa is wonderfully a drawn young woman who is easy to empathise with. She does know her own mind and has gut instincts, but at times she is manipulated by others, believing everyone is telling the truth. When she realises that she has been duped, she berates herself – something I am sure we can all identify with. 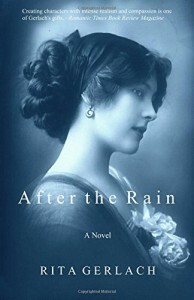 After The Rain educates the reader in some of the historical events of the day as the San Francisco earthquake of 1906 is mentioned, followed by the Messina earthquake. The problems of living in an age without technology to unite the world are highlighted. The bond of friendship is revealed in After The Rain not only between Louisa and Millie but also between Louisa and her friend Amy. Where there are secrets, friendships can be strained but love always prevails. There are differing families shown within the novel. Louisa’s is a strained family relationship. Jackson’s is one of love. The elderly aunts Mildred and Maud are another family unit and the children in the home, another. Whatever family one is in, the need for love is the most important. I thoroughly enjoyed After The Rain and greedily devoured it. I identified myself with Louisa and loved journeying through the book with her. All Rita Gerlach’s books are compulsive reads. Pick up After The Rain today and give her a go. This sounds like a wonderful book. I love autistic and Down syndrome kids–they are so living and my heart has a special place for them. All families have issues, most of which love and tolerance can make such a difference. This book sounds fabulous. I can’t wait to read it.